The pens to have for this are Colour Class Pale Hues and using just three pens from that set we will produce a really different look. There have been several videos added to the website to help you making your choice with these pens. They are the Crafters dream and well within most peoples price range. will tell you about the system and then work your way through the others until you feel more confident. Because basically that is what colouring is all about ... You having the confidence to lay down that colour and making a start. 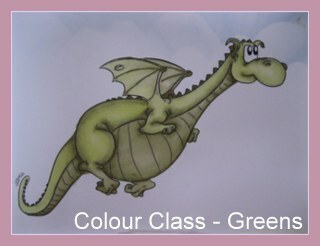 Colouring should be enjoyable and not something that stresses you at all. Give your self the time you need to do it and then relax and play. There are many images to choose from covering all the subjects and occasions you could want. And he may not be the prettiest character but he is an excellent choice to colour in. 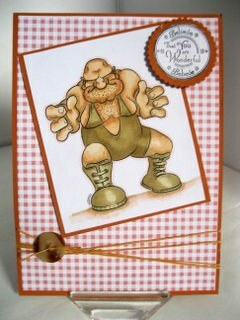 And once he has been added to a card he is sure to bring a smile to anyones' face. The video will show you how to get this blend using the six pen set of Pale Hues and is sometimes labelled Skin Tones. 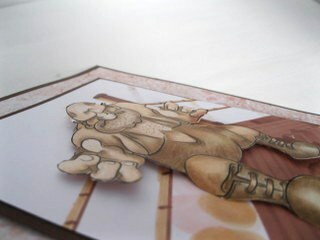 Once you have your image coloured you can add him to a card. 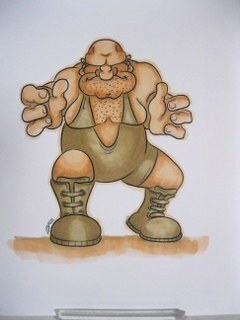 For this one I have used the same pens and added a wrestling ring around him, shadow under his feet... and the impression of faces around the ring. 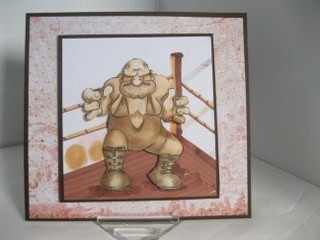 But I wouldn't want to step into that ring and take him on .... would you ?? ?